I saw this the other day and it struck such a chord with me. My heart has been pretty beaten up the past few years and I think part of it is because things have changed so drastically for me. In four short years, my life has been turned upside down. People have left my life, never to be heard from again. Of course, I have left other people's lives because it was better for my mental health and well-being. I think the hardest part is the family that I don't hear from any longer. Not just blood family but church family - and I don't know why. I am in a grieving period. My heart is broken and there have been way too many things that have changed for me to cope right now. I've been coping for four years but everyone has their breaking point and I'm at mine. It's like you're dangling from a thin piece of rope one day, hanging on for dear life, and then something or someone cuts that rope and you're mentally and emotionally done. It comes down to just self care at that point - like a cat licking it's wounds. Being quiet and introspective. Yes, I know that Jesus is with me. God tells me that in the Bible and I believe it and it allows me to keep going but, you know what? Sometimes we need our people around us. Sometimes we need people to reach out - not out of guilt - but out of true genuine caring. We need people to put aside their own personal prides and self-interests and be a part of our life. A true part, not something done out of guilt because that's just the worst. It's even worse than the being alone. I'm not asking for pity or for anyone to feel guilty. I'm just trying to work this all out in my mind. I also think I'm not the only one feeling this way. The world has gotten smaller and that has made us smaller. Social media makes us feel like we have friends from all over the world but are they really a part of our every day life? Our families become part of the whole online experience and there's no "day-to-day, messy, get involved in our life" parts anymore Everyone is kept at arms length because it's easier. We can like a Facebook post or Instagram picture and feel like we're a part of other people's lives, but are we really? People ask for prayers on Facebook and we promise to pray but promptly forget after closing the app. I'm just as guilty of this as the next person so I'm not condemning anyone here. I'm just saying that it's so much easier for us to click a like and then move on these days. There's not the cards sent in the mail or the phone calls to our friends because how many of us truly have close friends anymore? I don't. I think those with truly close friends are far and few between. I am so very, very thankful for my husband who stands beside me through thick and thin. These four years have been just as hard for him and he wondered several times if I was even going to live. He puts up with so much from me as my emotions are all over the place. It's all part of the healing process and also the process of coming to terms with loss. There are other family members who have been such strong forces in my life - like my son and parents - who never leave me and love me for who I am. This journey hasn't been easy for any of them either. I hesitate to post this because it's a pretty raw, emotional post. It tells you exactly where I'm at and, these days, that's a scary thing to do. It's so much easier to post the pretty things, the positive things, whether they be true or not. I'm not depressed (for those of you who may think I am), I'm probably just more angry than anything. Yes, there is sadness over the loss of some of the people of my life, those I thought would always be there with me, but I'm determined to move forward. The biggest challenge is not to be hard-hearted and I am struggling with that, too. How much easier not to let anyone into my life in the first place then to have them crush my heart in the end? It's a struggle! I honestly don't know if I'll leave this post up. I think it's so important to be real but, in doing so, am I opening myself up for more heartache? I also want you to know that God is everything to me. He, alone, has worked so many miracles in my life and I never, never blame Him for what has transpired in my life. I know where the blame lies - with the evil one who stalks us. He just waits for the opportunity to crush us. I'm refusing to be crushed! With Jesus, I don't have to be crushed. I may be bruised and a little torn up but I'm not crushed. In sharing this, I hope that it will help someone else to know that, just because you're a Christian, bad things will and do happen. However, because we have Jesus, they don't have to destroy us. His love is always there and He is always with us. Yes, it would be so nice to have the people around us in our lives, but isn't it a comfort to know that Jesus always is in our life? 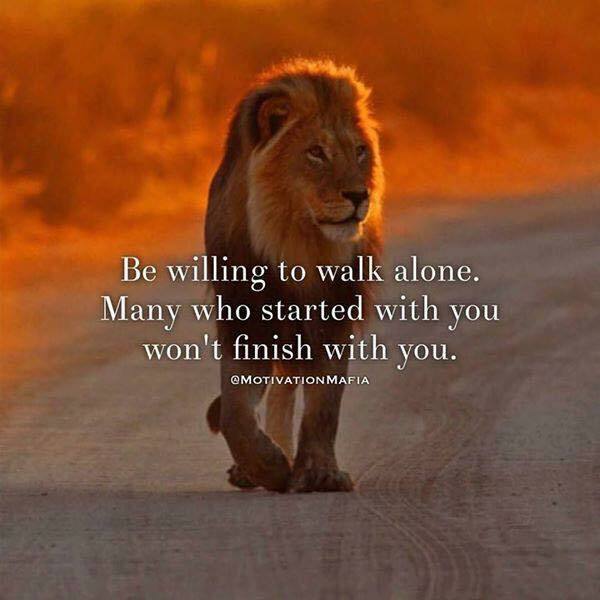 Thankfully, with Him, we don't have to walk alone! I am sorry Julie. I actually know exactly how you feel. My best friend just up and left out of my life and it hurts still to this day. I do not know why. There was no fight. She just moved on and this was years ago. I am SO sorry to think of the pain you are going through. I know it doesn't help your own pain to hear this, but I do understand. I hope you know that there is just one point where you are wrong ~ you DO have a friend here. I know I am not able to correspond very often, and sometimes the load is so heavy on both ends it is hard to let is shine through, but I DO care deeply about you and only want the best for you and love you dearly. May Jesus wrap His loving arms tightly around you and heal every heartache, physical need, and deep wound. Your words resonated deep with me today, and I could so relate to a lot of what you said. God bless you.